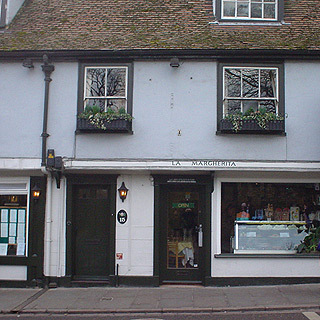 Comparitive reviews of cafes and restaurants in Cambridge, England. 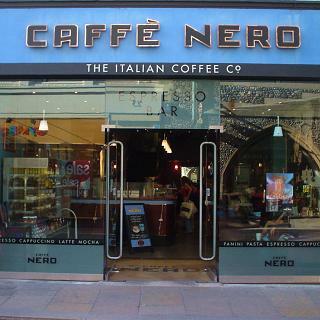 The following list of cafes are reviewed on this page. 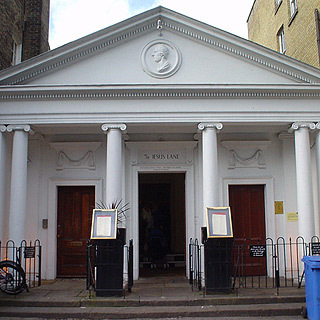 Some of the reviews on this page are years old, and we only do updates for Cambridge every couple of years, so some reviews indicate when we last visited. This is actually a Pizza Express cunningly disguised as a decent restaurant; which it is. Although the pizzas are pretty good it is the atmosphere, the swanky decor and the live jazz which make this place a must. A comparison with Browns is inevitable here: 7a Jesus Lane is smarter, cheaper and has better sofas, whereas Browns has a more natural atmosphere and much better food. Verdict: since you can't hear the jazz from the restaurant rooms, you should find somewhere else to eat and only use 7a Jesus Lane for its coffee, cafe and music. 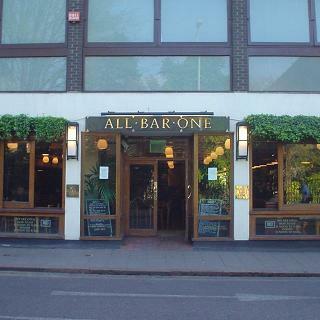 All Bar One is a pub, but I include it here because it's a better restaurant than it is a pub, with it's posh pub meals. The varied menu essentially contains rather stylish versions of normal pub food, for a bit more money than usual. Fortunately, though, this works just as well for the food as it does for the beer and decor - what you get is excellent. The atmosphere is clean, light and modern with big tables and plenty of room. This, and the interesting but varied menu, with lots of good vegetarian options, makes it good for large parties. Verdict: go with lots of your mates, eat a burger, and make sure they pay for at least the drinks. This Thai restaurant manages to serve excellent food without being too dear. 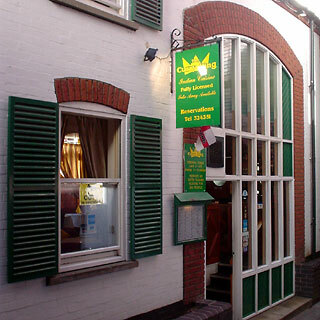 The service is very good and the atmosphere is more relaxed than in most oriental restaurants, which is a pleasant change. Verdict: go regularly, either to eat in or take away. This is an excellent location for an afternoon's reading in the sun if it's too hot to walk to Granchester, or if you just can't be bothered. The cafe itself seems to have the right kind of things on offer, although on a hot Sunday afternoon all I wanted was a cup of tea. The furniture is good - wooden benches, chairs and tables, with a good mix of sun and shade. British bakery meets noodle bar here, in a typically Cambridge international mix, with a few onion bhajis and samosas thrown in for the incongruity. The window stools have a nice view of the blissfully traffic-reduced Bridge Street, making this a pleasant spot for a snack and a drink. 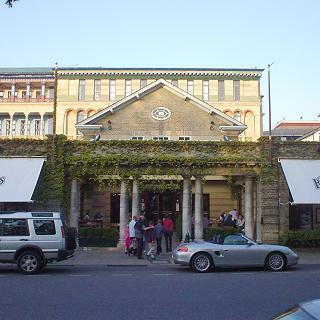 Browns is a busy English colonial style restaurant complete with big fans and jazz pianist. Browns is bright and fun, always filled with bustle and attracts a varied crowd. The food is mostly English and rather good; the menu is large which is handy when you go back for the sixth time. They do not accept reservations after 6 p. m. so you may have to sample the cocktails at the bar while you wait for a table. Browns is justly popular. If you haven't already, try the fairly original pasta dishes followed by every single dessert on the menu. Verdict: go with anybody and everybody, and eat one of the fish specials or the excellent steak and Guinness pie. Despite being a formulaic chain, Café Rouge does a good job of reproducing a modern-day Parisian bistro. As with a blended wine, what the food and decor may lose in flair, it gains in consistency across time and place. 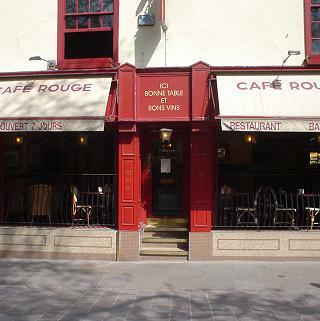 As elsewhere, this Café Rouge has a pleasant atmosphere with smart decor and the signature triplet wall lamps, and is best of all if you get to sit by the open front on a sunny afternoon. Verdict: not bad for a French meal, and formidable for coffee and cafe. 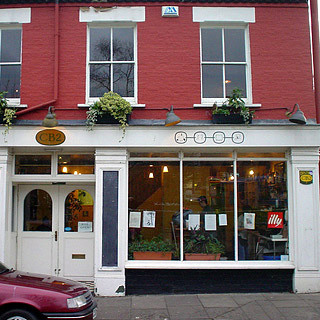 This is the most stylish of Cambridge's cafe chain 'outlets' and avoids Starbucks' familiar soullessness. Unfortunately, its deserved popularity makes it difficult to get a seat at the weekend. I guess Cambridge just needs more cafes. 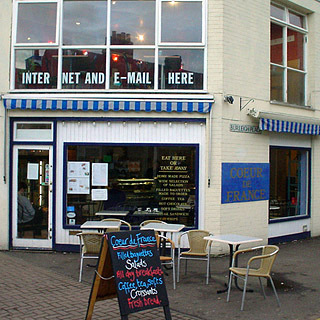 Like all the best things in Cambridge, CB2 is unusual - as well as being a cafe, it sells books, has Internet access and serves hot food. This homogenous mix is reflected in the chatty crowd, which is very diverse, and a friendly atmosphere. I didn't try one of the pricey meals; instead I had soup, a toasted salmon ciabatta and carrot cake. All of it was excellent, and worth the above-average price. More recently (first spotted in 2014), CB2 has an outside terrace, with half a dozen tables and umbrellas. Verdict: go with your next-door neighbour and eat ciabatta and cake, preceded by six-hours of coffee. 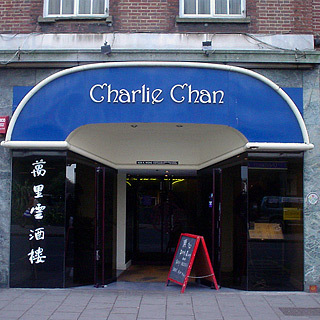 Top quality Chinese restaurant which narrowly missed being my favourite, but might be now, now that Tai Cheun has changed. The menu is interesting, the food good and the service attentive. The decor is understated, unless you eat in the upstairs room which goes beyond naff with its black walls, chrome, strip lights and mirrors. Verdict: go once to try it out and eat the crispy duck of course! I wandered into Coeur de France for coffee but I did not say, despite the appetising edibles, because the bustle of the big queue and the staff rushing around to the sounds of loud commercial radio meant that I was never going to be able to settle into my book for a quiet read. I did notice that since my last visit, the upstairs seems to have transformed itself into a separate Chinese restaurant, but downstairs looks the same as it used to. 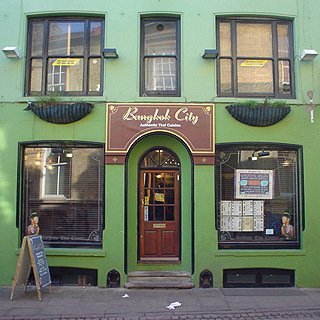 This small and cosy Indian restaurant is surprisingly good: the good food, service and atmosphere are not at all what the tacky green and yellow sign out on Bridge Street or the name suggests. It might be the small size that helps with the pleasant atmosphere. The first time we went, the Bollywood soundtracks are kept down low and there wasn't too much other noise. The staff never forgot us either, not that the downstairs room is big enough for anyone to be ignored. More than that, perhaps, the big jug of water that came straight away told us what to expect. Besides, that's a welcome addition to the poppadums and John Smiths. I enjoyed the food; I may be easy to please when I've gone so long without a good curry, the lime rice with chick peas was especially tasty. 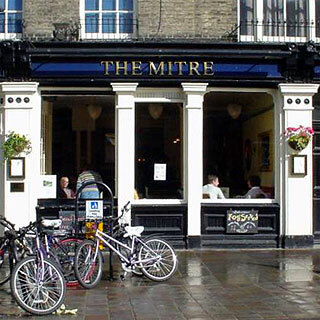 My second visit, in June 2004, was rather different on account of the 26 students at the next table celebrating the end of the year; that'll teach me to be in Cambridge during May week. Still, that was no excuse for the sloppy service typified by cutlery just being dropped on the table in front of each of us. The food was still good, but I'll reserve judgement on the atmosphere and service. Verdict: best Indian food in the centre of town. This old lunchtime staple has quite a bit of outside seating, to go with an extensive lunch menu. The happily secluded internal courtyard can be a sheltered sunny spot, and that sort of thing is always popular. By the time we could not take any more of the burning sun, there were several people hanging around ready to take our places. 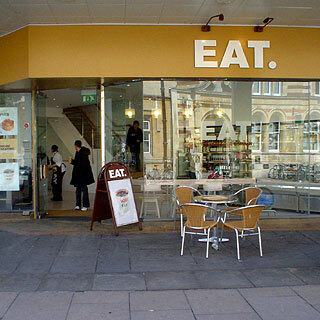 Eat is an unusual phenomenon that I had originally misconstrued to be yet another yuppie chrome-plate sandwich shop clone, à la Prêt. It turns out that the menu includes such British delights as pies; the sausage and mash pie with mustard I had was a culinary Dream Come True for an expat on a weekend visit. More unexpectedly still, the upstairs is a huge canteen area with about thirty tables that is actually pleasant to hang around in: a sort of modern Copper Kettle, with understated white, beige and brown decor and big windows. The clientele makes it a kind of student canteen on a weekday lunchtime, ranging from frantic gossiping to would-be quiet study. All of this good stuff makes this one of the few places where I do not mind having to get my food on a tray before hunting for a table or eating out of a cardboard box. Recommended. 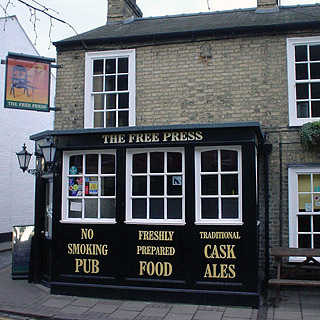 A tiny place hidden away in a quiet back street, Free Press is a proper pub with proper beer and good food, which is distinguished by its enlightened smoking policy: you may not. 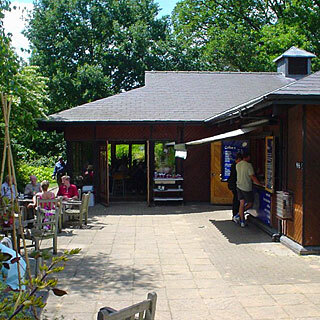 The food is good - may favourite lunch is the large portion of game pie with side salads. Verdict: go for lunch with a couple of friends and have a meal and a couple of pints. Hell, fill the place and have lots of pints. This cosmopolitan restaurant is worth investigating on account of its fairly unusual menu and its rather special narrow terrace at the river's edge. The food is marvelous and the atmosphere one of the best around. 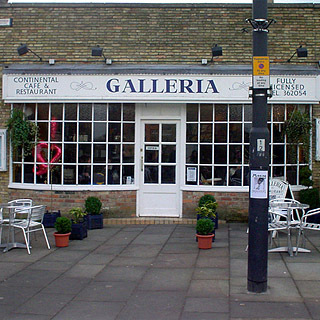 Galleria has a similar down-to-earth but slightly posh style to Browns. Going back to Galleria, I liked it much more than I had the first time, probably because it's less intense at lunch time. Verdict: have interesting pasta dishes for lunch with friends, and take your date there later on. 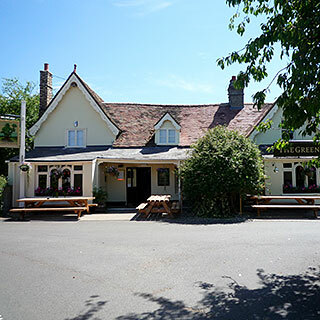 Sunday lunch in Granchester is something of an institution in Cambridge, and The Green Man has the best pub lunch, having slightly more original food than the Rupert Brooke and more of a real pub atmosphere. Best of all is the 'Sorry No Children' sign, which makes The Green Man worlds apart from The Red Lion opposite, which has a kiddies' playground area inside that seems to be designed to generate the maximum amount of screaming. I'm sure they're all little darlings, but they tend to spoil appreciation of my pint of beer. The menu includes some weird Anglicised versions of Mexican food that is actually rather good. My chicken burrito looked more like a lasagna, but it tasted excellent and contained a suitably large quantity of fresh chillies. The Sunday Roast got a general thumbs up, although it was still closer to cheap 'pub food' than the mythical Real Thing. To accommodate the crowds, there are lots of tables in the garden that stretches from the back of the pub to the footpath from Cambridge. On our last visit, on a deserted weekday afternoon, this was the ideal spot to enjoy a plate of fish and chips and a beer, both excellent. Verdict: go with visitors to Cambridge, for the walk along the river from Cambridge, and the sheer quaintness of it all. Starbucks' huge coffees used to impress me, but then I was converted to Indigo Coffee House's audacious three-shots-of-espresso-and-marshmallows effort. 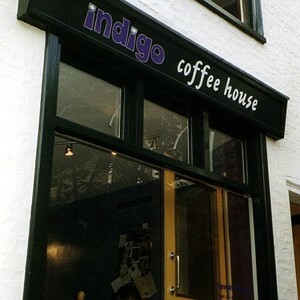 As well as being small, Indigo Coffee House is a much more friendly experience than the other nearby cafes. Indigo Coffee House is cheerful and relaxed - a healthy antidote to the latest crop of production-line coffee 'outlets'. Sitting around downstairs or in the colourful room upstairs feels like being at your mate's place, except that the coffee and hot snacks are good. Clearly Claire Hawkins, proprietor, doesn't plan to leave the student culture behind. The only problem with the massive success that's inevitable for something this good is that you have to be really persistent to find somewhere to sit in somewhere this small. I recommend arriving at 9 a.m. and serial-drinking coffee for as long as you can take it. This refreshingly unpretentious Italian restaurant serves good, but not outstanding, food. The pasta is probably better than the pizzas, and the best	time to go is on a Monday or Tuesday evening when there is a very good folk	guitarist who strums his stuff unobtrusively in the corner. Verdict: go with your best friend and try the seafood risotto. I do not normally go into pubs when I am out reviewing cafes, but last time I walked past here I could not resist a pint of Timothy Taylors Landlord and an hour on the comfy leather sofa by the window with my book. Despite the popularity of sofas in pubs these days, few are actually a good place to chill out - like a good cafe. In here, though, it is more like the lounge of a nice old-fashioned hotel, with worn leather and lots of bare wood around, and plenty of greenhouse effect from the huge front window in the afternoon. The Picturehouse cafe has the best ambiance, with its big open studio-like space, whose big windows make it particularly light during the afternoon, and its selection of classic music. Best of all, of course, is the surprisingly large collection of surprisingly comfortable sofas, which are complemented by a big stack of newspapers (the Independent). 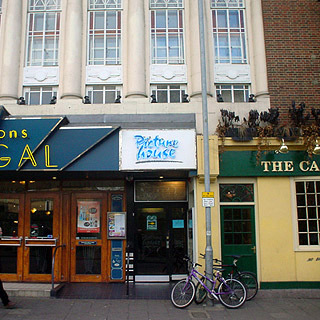 Oh, and it has its own three-screen cinema that frees you from ever having to endure that other place. 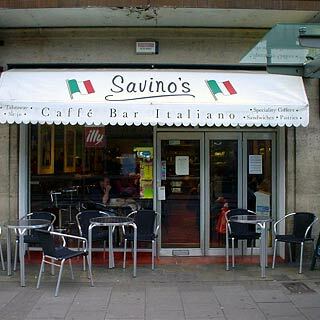 Authentic Italian urban cafe that is a good place to pop in for a good coffee, but not the sort of atmosphere to hang around in. 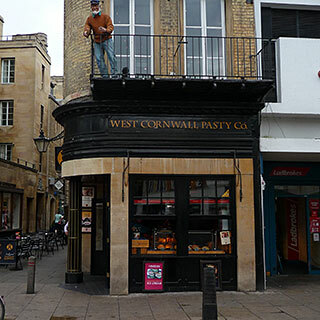 The West Cornwall Pasty Co. is an accomplished chain that does a good job of serving up hearty traditional grub in rustic surroundings. The menu is all about numerous varieties proper pasties, which were only available in Cornwall (and possibly Devon) until the late nineties. Strictly-speaking, pasties are for wet stormy weather, or at least a light drizzle, which you do not get much of in Cambridge but this is still a good choice for a good-value hot lunch, especially on a cold day. 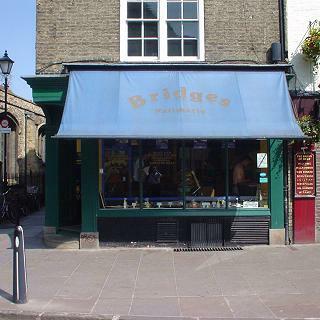 As with many of their locations, the best part of the pasty experience in Cambridge is to be found upstairs, where two lavishly-cluttered rooms provide the nearest thing you can get to peace and quiet in the centre of Cambridge, with lots of comfy armchairs to sit around in as you enjoy your steak and ale pasty and cup of strong tea. The best place to sit is probably at the front, by the windows that open out onto the market square, where you can join the old fisherman (see photo) gazing at the crowds of tourists below.